I have the base model, front load sing disc CD. No phone setup in the rear compartment. Looked at Crutchfielde but already confused. Any advice? $100 or so is the magic number. Hey Oldmactech I have an 03 5-speed with Same audio set-up. I do not think there are any DIN 1 units to replace the one you have. (meaning that if you leave the current CD in [Why?] you may not find a suitable upgrade), so you may be forced to install a more robust system. I just got the Eonon 7.1 Android from Amazon ($239) and I am going to install it this weekend. I will start a new thread since this specific upgrade has not been well documented. Thanks. Don’t know the nomenclature-what’s a Din 1? Need the single CD, I do some home recording and burn discs to test the mixes. My xtron Unit has been fabulous. I run it every single day with all my apps, ways and all. Works like a charm and saves all my Spotify music. Plug and play. Do you have the DSP amp? I don’t think so, is that inthe rear compartment? Nothing in mine. Does your radio say DSP on any buttons? No, no DSP button on the radio. Phone button but doesn’t seem to be connected and manual implies it has to be upgraded. All the above can be had for under $250. Plug and play into your existing system. Why do that when he can buy a whole brand new unit with Bluetooth and everything built in? First things first - you can't just "pull the old radio" - you don't have one. In the setup you have, the CD Player and and Radio are actually in the same unit (what you are calling the single CD). The CD player, the radio receiver and the amplifier are all inside the "single CD player". The unit you are calling a radio is actually a "Multifunction Information Display" or MID. It might look like a radio but it's just a bunch of buttons and a display - nothing more. If you want to change the audio components to something a bit more modern, then both the MID and the single CD player will have to be pulled out and replaced. Removing the MID will remove access to some of the "computer" functions like the trip counter, gas consumption info etc. (or at least, the ability to display these functions - they still exist in the car and can be displayed on the dash - just not reset etc.). this lost access can be replaced by software and hardware in a new system, if you can you wish to retain access. Many of the newer 7" units still have a DVD/CD player, so you won't have to lose this option. DIN (Deutsches Institut für Normung) is a reference to a standard car radio size. Most "normal" car radios are single DIN (in height) but double-DIN units are also available. 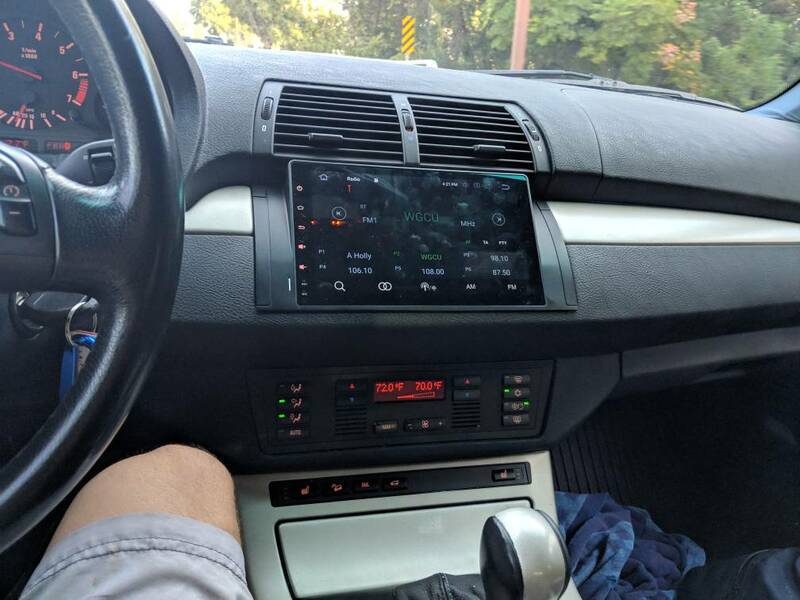 I recommend avoiding the fitment of any DIN (or double-DIN) system to an E53 - there are better custom options available. Some of the systems mentioned above are likely great. Many unit from brands such as Avin, Eonon, Seicane atc. make excellent custom E53 units that will fit right into your dash with very little work (you don't have DSP btw...) and will provide all the functions you listed. Secondly, I don't have any of them, so I'll leave it to others to recommend their favourite one (although I'd grab a Seicane S6902 if I was to do this). Last edited by wpoll; 11-30-2018 at 06:40 AM.